ROYAUME UNI – Leicester - A car park could prove to be the lost grave of King Richard III of England. The first archaeological search for the lost grave of the medieval monarch killed at the Battle of Bosworth is due to begin. The challenge for researches from the University of Leicester is to find the site of a church in the city where it is believed King Richard III was buried in 1485. The famous battle inspired a scene in Shakespeare's play Richard III in which the defeated ruler cries: “A horse, a horse, my kingdom for a horse!" In fact, debate over where exactly the Battle of Bosworth took place has been going on for centuries. Historians initially believed that it happened on Ambion Hill, near Sutton Cheney, where a stone memorial supposedly marks the spot where Richard III died. The king's body was then thought to have been taken to Leicester, where he was buried in the church of the Franciscan Friary. But the exact whereabouts of the church, known as Greyfriars, have also been lost in time. The remains of the late monarch could have been thrown into the river, according to some rumors. If the remains of Richard III are unearthed, they will undergo DNA analysis. ROYAUME UNI – – Bath - Advanced technology has been used to create a permanent record of the state of mines under part of Bath. Archaeologists working alongside miners stabilising the Combe Down Mines called in a specialist scanning firm to carry out millions of measurements of the subterranean workings. Specialist firm Oxford Archaeology has now been highly commended in this year’s British Archaeological Awards, and employed laser scanning company APR Services to take highly accurate measurements of the abandoned limestone workings.These were used to create a permanent record of the internationally-recognised heritage, wildlife and environmental site and help with the stabilisation work, which involved foamed concrete being injected into the mines. “The mines were so unstable that no access was allowed beyond the constructed roads and walkways and there was limited light and very cramped conditions. 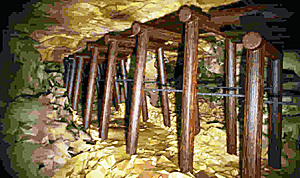 We therefore had to keep the scan process as simple as possible while protecting ourselves and our equipment yet capture as much detail as possible as quickly as possible.” The firm has produced a 25-minute fly-through animation of routes in the mines, which is on You Tube - search Combe Down Stone Mines. This will form the centrepiece of the archaeological galleries at a new heritage centre planned for a former builders’ yard in Combe Down. ROYAUME UNI – Eliseg - Archaeologists from Bangor and Chester Universities are returning to carry out a third season of excavations at the site between 26August -16 September 2012.This collaborative research project is using modern archaeological methods to investigate the mound on which the Pillar of Eliseg stands. The Pillar of Eliseg, originally a tall stone cross, stands on a mound and is still a striking landmark .Now only part of a round shaft survives set within its original base. Almost invisible to today’s visitor, the Pillar once bore a long Latin inscriptionsaying that the cross was raised by Concenn, ruler of the kingdom o fPowys, who died in AD 854, in memory of his great-grandfather, Eliseg, who had drivenAnglo-Saxon invaders out of the area. By the seventeenth century the Pillar was no longer standing, but the damaged inscription was recorded by the famousWelsh antiquary Edward Lhuyd in 1696. The mound was dug into in 1773 by the local land-owner Trevor Lloyd and is reported to have contained a stone cest with a skeleton. He also re-erected the Pillar and this is recorded in a second Latin inscription on the shaft. During the first season in 2010 excavations focussed on three trenches on the mound. A cairn of stones was revealed which, it is suggested, is an Early Bronze Age kerb cairn with the eighteenth-century antiquarian trench dug into it. Trench A. This trench was the focus of excavations in 2011. The antiquarian disturbance, which had post-medieval pottery sherds in it, was removed. The undisturbed mound in this trench was then partially excavated revealing a likely early medieval long-cistgrave in the section as well as evidence suggesting the interment of cremations during the Bronze Age. FRANCE – Monts et Sorigny - Les fouilles archéologiques préventives menées sur le chantier de la ligne LGV, à Monts et Sorigny, ont mis au jour des vestiges gaulois et gallo-romains. A Monts, sur le site du Petit Nétilly, et à Sorigny, sur le site de Montison, les fouilles de l'Inrap (Institut national de recherches archéologiques préventives) ont dû être prolongées face à l'intérêt des découvertes. Les archéologues ont creusé le sol, à la pelle mécanique et à la pioche. A Monts, sur une zone de 3 hectares, quatre fossés délimitent un enclos où des vestiges qui datent de 2.500 ans ont été trouvés. L'emplacement probable d'une mare, une voie en pierres partiellement dégagée et des morceaux de céramique et de terre cuite, attestent d'une présence de l'homme remontant au moins au IIe siècle av. J-C et se poursuivant jusqu'au Moyen-Age. A Sorigny, c'est une zone de plus de deux hectares qui a été fouillée sur le site de Montison, là où la ligne LGV coupera en deux le domaine forestier de Longue-Plaine. On y a repéré les vestiges d'une vaste ferme gauloise, remplacée plus tard par des constructions gallo-romaines. « On voit dans cette tranchée la trace des gros poteaux qui ont été enfoncés profondément dans le sol. On peut imaginer qu'ils soutenaient un bâtiment assez haut », commentait hier un des responsables de l'Inrap sur place, De ces terrains qui seront prochainement avalés par les mastodontes du chantier LGV, une cinquantaine de caisses de vestiges ont été retirés. Parmi eux, plusieurs trésors archéologiques : une amulette en métal, une clé romaine en fer, plusieurs pièces romaines en bronze, un gond en os et l'anse en cuivre d'une coupelle. Précisément répertoriés et mis sous pochettes plastique tels des éléments de preuves, ils feront l'objet des analyses d'autres spécialistes qui rendront leur verdict plus tard. Les fouilles archéologiques préventives se poursuivront jusqu'au 7 septembre sur le site de Monts et jusqu'au 27 septembre sur celui de Sorigny. ASTRONOMIE – - Observatories in Britain, France and the United States, a pharaonic temple in Egypt, a 3,000-year-old pillar in China and a 1920s tower in Berlin have been inscribed on a UN-backed heritage list for astronomy, unveiled on Friday. The Portal to the Heritage of Astronomy (http://www2.astronomicalheritage.net/) aims to give astronomical sites the same place in public awareness as UNESCO's World Heritage List does for places of historical importance. The website was launched on the sidelines of an International Astrononomical Union (IAU) meeting in Beijing on Friday, the IAU said in a press release. It is being backed by the UN Educational, Scientific and Cultural Organisation (UNESCO). The portal has a preliminary listing of around three dozen sites, ranging from prehistoric caves to 20th-century observatories, but should expand swiftly in the coming months, the IAU said. Among the first entries are Stonehenge, which is aligned along the axis of the midwinter sunset and midsummer sunrise, and the Dengfeng Observatory in Henan, China, where Tang Dynasty astronomers used a pillar to measure the Sun's shadow and thus calculate the length of the year. There are also the Royal Observatory in Greenwich, the Meudon Observatory in France, the Mount Wilson Observatory in California and the 1920s "Einstein Tower" in Potsdam, all sites where important contributions were made in the era of modern science. Eventually, the portal will not only feature sites and monuments, but also other types of astronomical heritage such as portable instruments and intangible cultural practices, as well as "dark-sky" locations, meaning places where the night sky can be viewed without pollution from man-made light. "A lot of our most precious astronomical heritage—both ancient and modern—is under threat. If we don't act to try to protect and preserve it, we run the risk of losing it," said the IAU's Clive Ruggles, a professor of archaeoastronomy at Britain's University of Leicester.